Lab created opal wedding ring set accented by white sapphires in sterling silver. 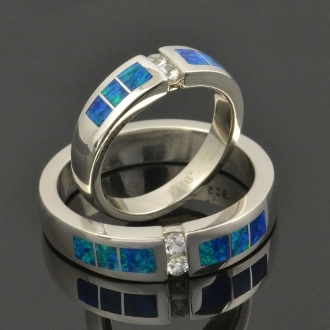 Beautiful inlaid blue-green lab created opal surrounds two round brilliant cut white sapphires in each of these unique wedding rings. His wedding ring has 2 channel set white sapphires totaling .16 carats. His wedding ring is 6mm wide at the top with a slight taper toward the bottom. The rings are available by special order and will take 4 to 6 weeks to make in your size. It is hand signed "MMH" by Mark Hileman on the inside of the ring. Her wedding ring also has 2 channel set white sapphires totaling .10 carats. The blue-green lab created opal in her ring is a perfect match to the lab opal in his wedding ring. Her ring measures 5.5mm wide at the top with a slight taper toward the bottom. This set is available in other opal colors. Contact us for color choices. These rings may be purchased as a set or sold separately. Also available in his and his or hers and hers combinations.